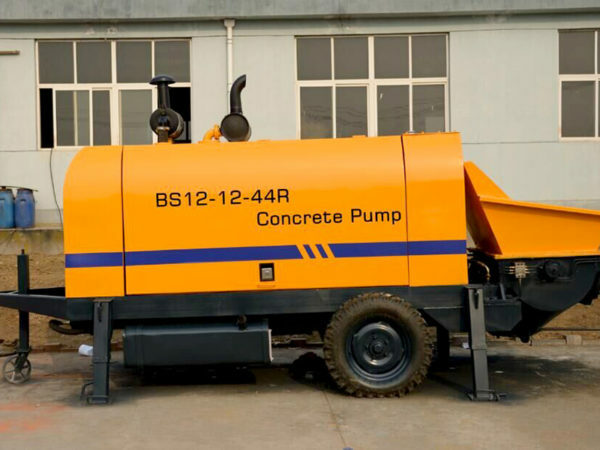 Concrete trailer pump for sale is the construction equipment for conveying concrete through pipelines, which is driven by hydraulic system. The machine is equipped with special pipes that can realize the continuous horizontal and vertical transportation along the pipelines. Concrete mixing truck transports the concrete mixed to the concrete trailer pump , then concrete trailer pump conveys concrete to the construction sites, which can realize the continuous pumping and pouring of concrete. 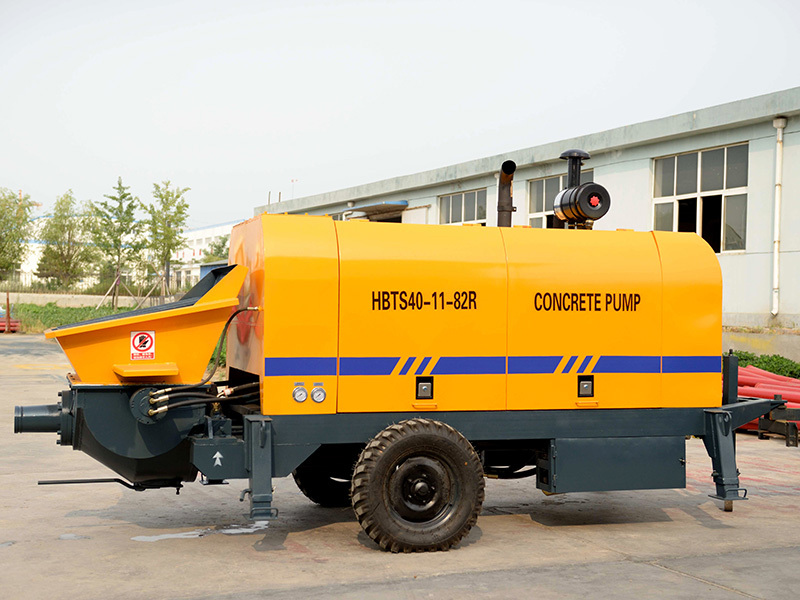 Usually, concrete trailer pump is mainly used in the construction of tall buildings, expressways and overpasses. At present, the concrete trailer pump for sale has been playing a more and more important role in new rural construction. Because of its simple operation and stable performance, trailer pumps for sale are welcomed by the general contractor. 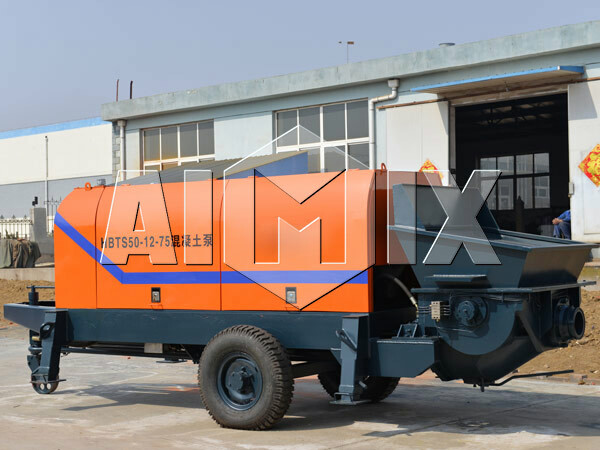 In the existing concrete pumping machine, concrete pump trailer is an ideal one. It is mainly used for conveying concrete in large projects. At present, it is mainly divided into the concrete pump on trailer of the gate valve and the concrete pumps on trailer of the S valve. 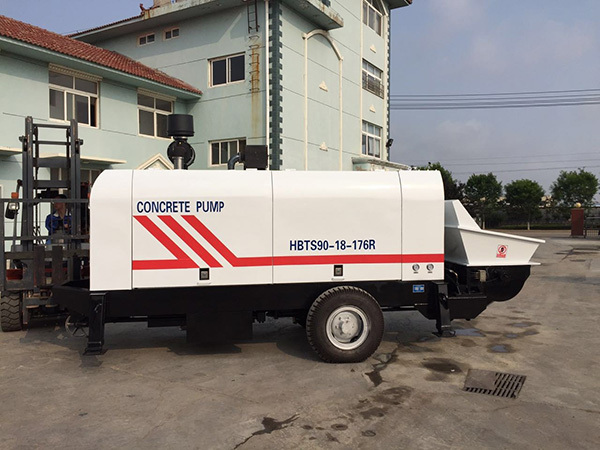 According to its dynamic type, concrete pumps on trailer can be further divided into electric trailer concrete pump and diesel trailer concrete pump. 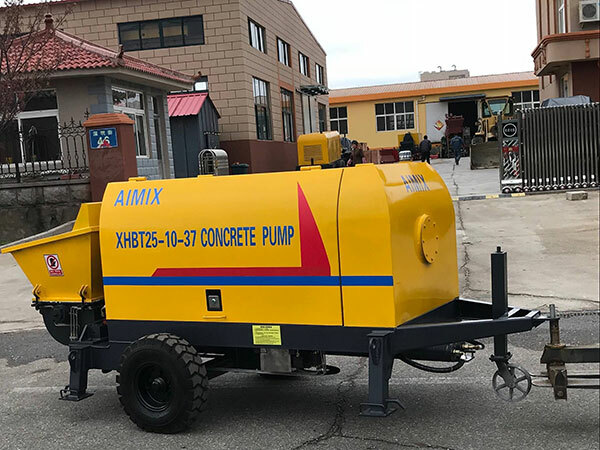 With the rise of modern industry, the construction of concrete has become one of the main way in the construction industry, so concrete trailer pump for sale has also become an important machine for transporting and pouring concrete in construction projects. 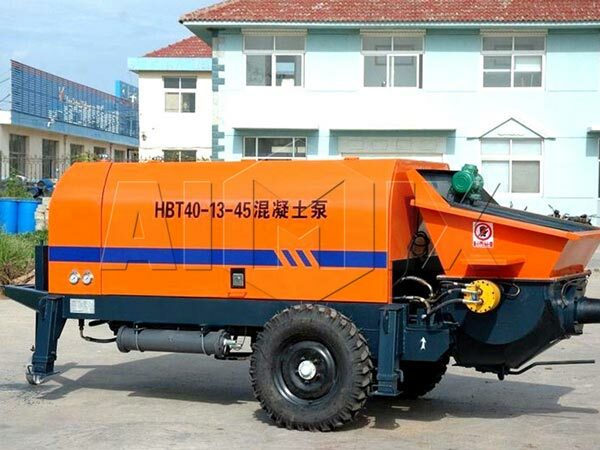 In recently years, trailer concrete pumps for sale of our company have received good reputation in many countries, and our trailer concrete pump with boom also has been exported to all over the world, such as, Europe, Philippines, Australia, etc. Our HBTS60 diesel trailer concrete pump was successfully exported to Philippines. Under the guide of our engineers, the machine was smoothly installed and worked normally. Our company, as the trailer concrete pump manufacturer and supplier, is professional and well-known in China, and we have occupied an important position in construction industry. Our concrete pump, trailer concrete pump for sale, concrete mixer pump, concrete boom pump, concrete mixer, concrete batch plant, and other products have been exported to many countries like Australia, Pakistan, Philippines, Kenya, the United Kingdom, Algeria, Fiji, American, Russia and others, and they have received high praise by our clients. 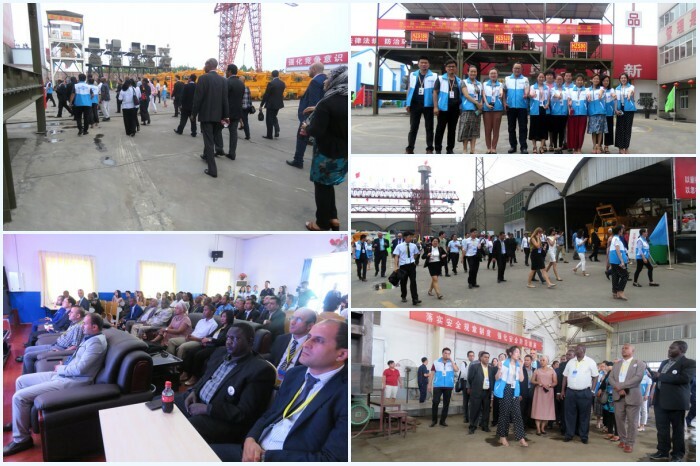 Few days ago, we invited our customers visiting our factory. We show them that how we produce the machine and how the machine work. Moreover, we also solved their problems about product. To sum up, if you need these products, please contact with us. We will provide you with the most favorable price and the most sincere service. 1. Streamlined appearance looks more novel and beautiful. 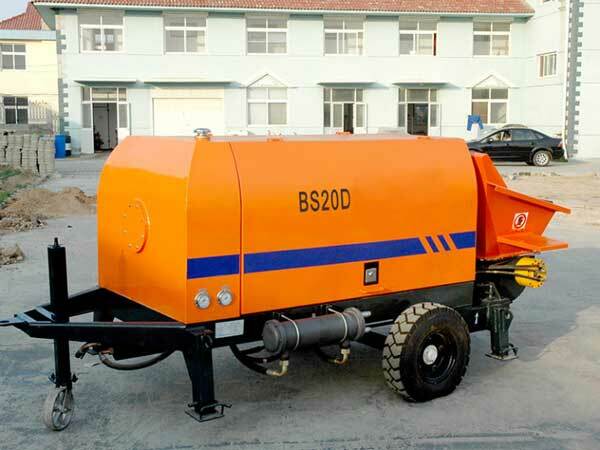 The design of trailer mounted concrete pump is more optimal. 2. Adopting double pump, double loop and open hydraulic system. Main pump oil circuit and S valve swing oil circuit are independent of each other, which makes the system become more simple, the component life become more prolonged and the reliability become higher. It is convenient to judge and eliminate the fault. 3. Wear parts such as spectacle plates, cutting rings, etc adopt mature technology, which makes service life become longer. 4. Fully consider the condition of maintenance, making maintenance become more simple. 5. The main cylinder is equipped with large cylinder diameter and long stroke. This ensures that the construction distance is the higher and farther. 6. All the spare parts meet the national standard, interchangeability is much better. 7. The S pipe is made of high alloy steel, which has the characteristics of large volume and non-aggregate. 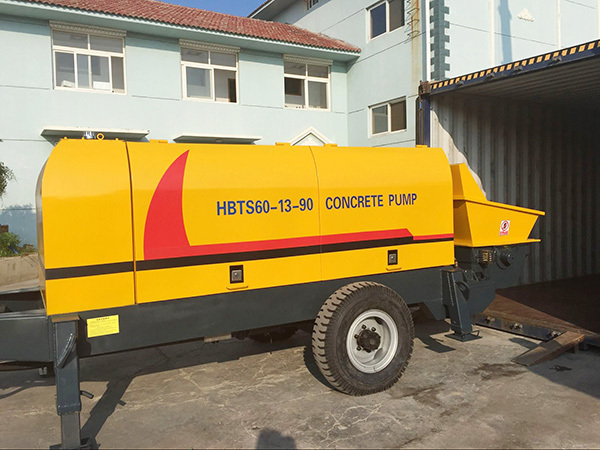 Concrete trailer pump for sale consists of hopper, pump body, hydraulic cylinder for driving slide valve, slide valve, conveying cylinder, main hydraulic cylinder and priority valve. 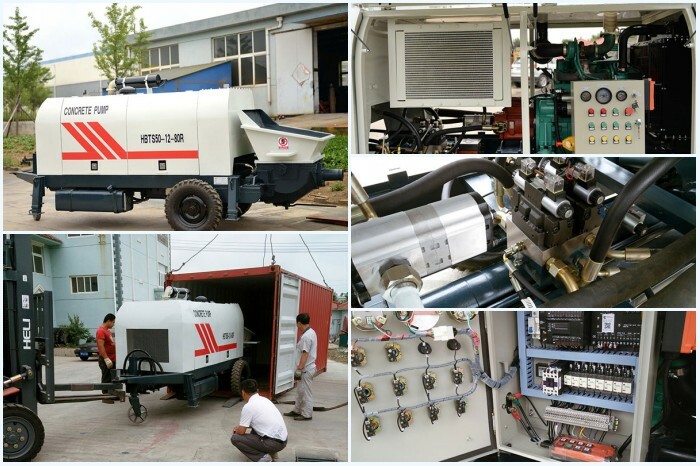 It has three systems to ensure the normal work of the trailer concrete pumps, namely the main power system, the pumping system, and the hydraulic and electric control system. The two concrete piston connects with the two piston rods respectively. When the machine works, the hydraulic pressure will enable the concrete piston to go forward and backward. Meanwhile, the cylinder will goes forward and backward with the driving of the concrete piston. Moreover, the outlet of the cylinder connects with the hopper. One end of the distribution valve connects with the discharge port. And the other end of the distribution valve connects with the swing arm, so that the valve can swing with the swing of the cylinder. When trailer pump pumps concrete, the concrete piston goes forward and back ward under the effect of the main oil cylinder. At the same time, the distribution valve and concrete cylinder will connect with the concrete cylinder and hopper respectively. 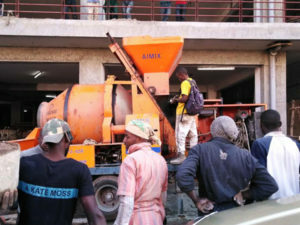 When the concrete piston goes backward, the concrete in the hopper will be sucked into the concrete cylinder. When it goes forward, the concrete in the cylinder will be pushed into the distribution valve and pumped. If the concrete piston goes backward to the end, the reversing device will come into effect. The main oil cylinder and the swing oil cylinder will reverse. Then the distribution valve connects with concrete cylinder, and the concrete cylinder connects with the hopper. In this way, the piston can goes forward and backward regularly, and the cement pumping equipment will pump concrete continuously. 1. New trailer pumps for concrete have a strong adaptability to the field of operation. 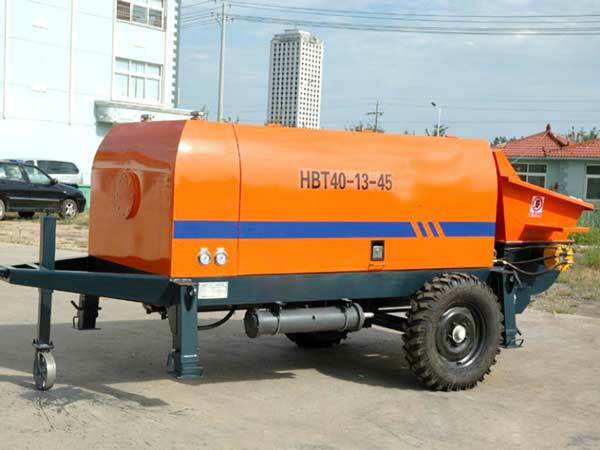 Concrete pump trailer for sale can work continuously, increasing the output distance to meet the needs of construction. 2. Save human resource in the process of operation, which significantly saves the cost, such as only one person to operate overall the pumping process, and the degree of automation is really high. So the intensity of labor is reduced greatly. 3. The equipment is lighter and more convenient to move, which is suitable for rural and narrow zone construction. 4. The quality of commercial concrete produced by small-sized trailer concrete pump is high. 5. Good lubrication and energy saving. The lubrication system adopts the automatic centralized oil-supply system, and it has the features of sufficient oil-supply and good lubrication. Moreover, the system has the prominent advantage of energy saving. Compared with the continuous oiling, the oil consumption will decrease to 50%.